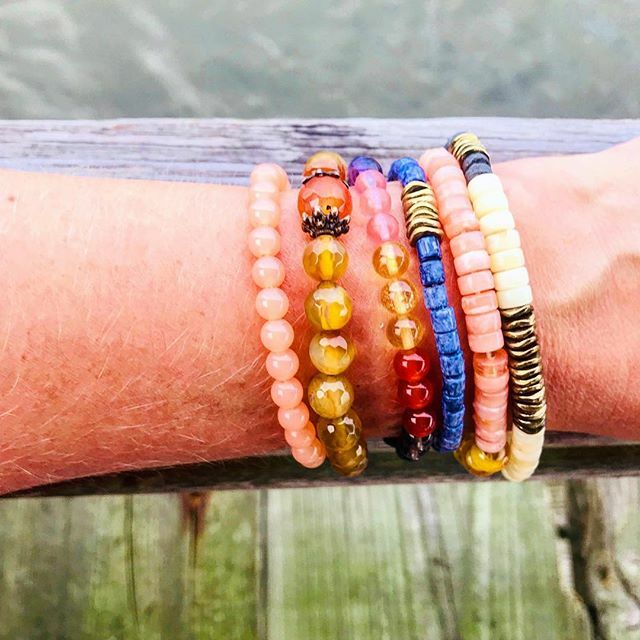 I’m sharing what to pack for a summer cabin trip *after* returning from my vacation to Alabama so you can learn from my experience and avoid over packing! What to pack besides the canoe, the kids, the dog and the kitchen sink – LOL! First we’re going to talk what to pack for clothes, then we’ll talk about other cabin essentials! A confession first: I overpacked. I’m sure that comes as a shock and is not at all the experience of most women. ;P So what I’m sharing is what I actually used and then I’ll run down what I could have left behind. If you follow me on Instagram, some of these pieces are going to look familiar! 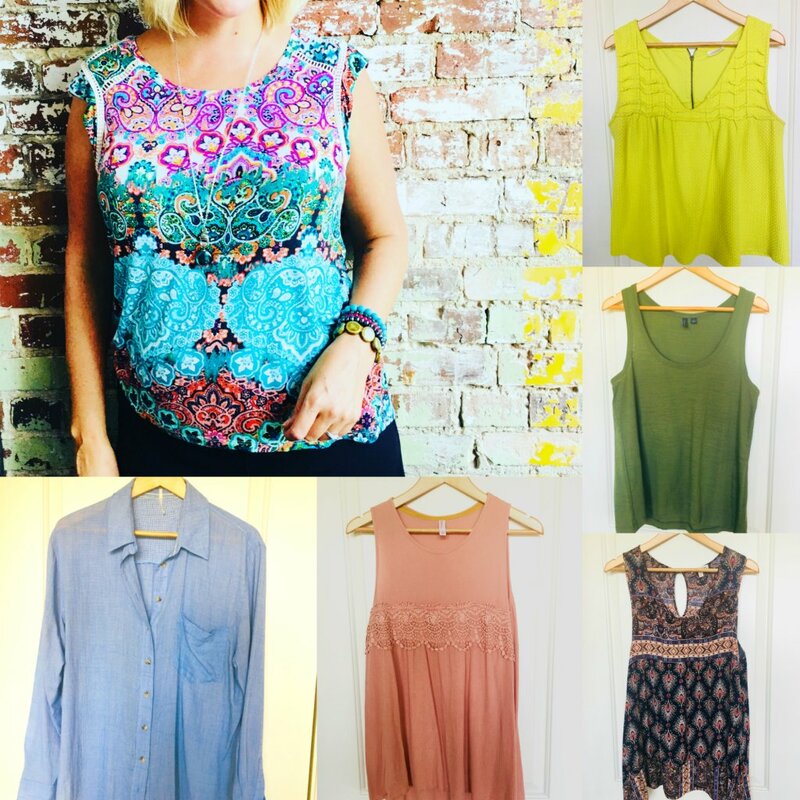 I packed five tops and wore all five of them, most more than once. These are *all* thrifted! The one long sleeve light weight chambray Free People top was a lifesaver on a very rainy day! 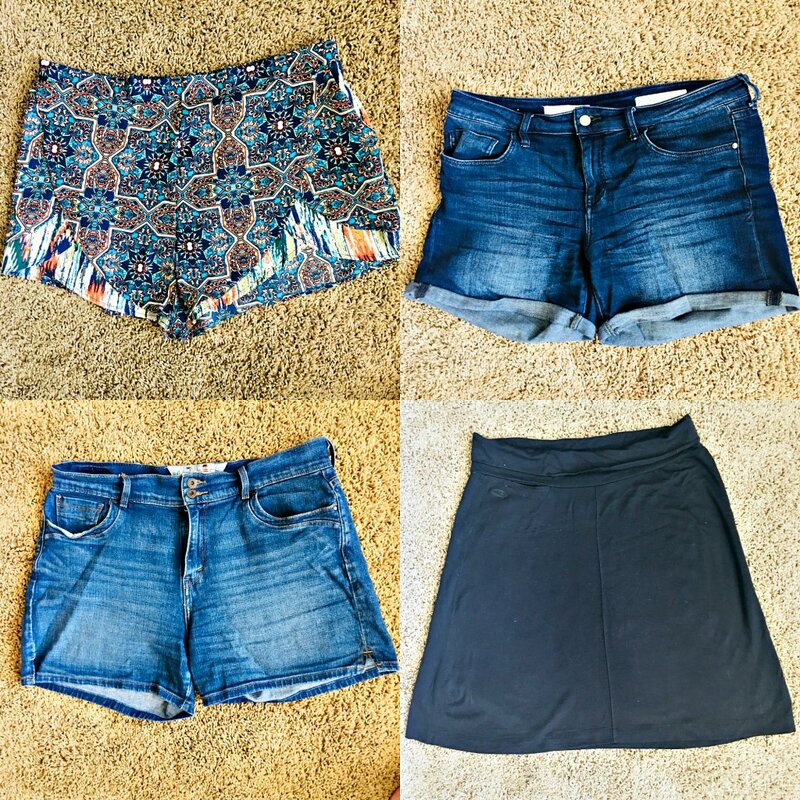 Four bottoms including my fave Icebreaker skirt which I wore while traveling. The shorts are all thrifted. 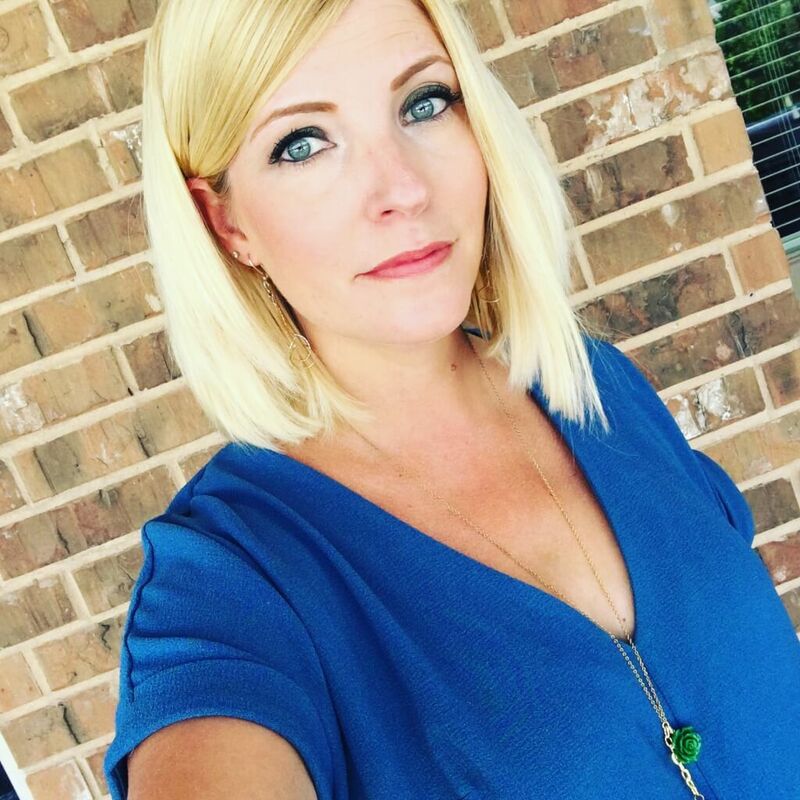 Two dresses – one which I wore to the National Naval Aviation Museum in Pensacola when I almost melted while watching the Blue Angels. The other I didn’t end up wearing but I still think you should pack at least one “nice” dress that you could wear on a date night or to a nice restaurant, should that occur. Basic black will never fail you, and this one could have done double duty as a swimsuit cover. 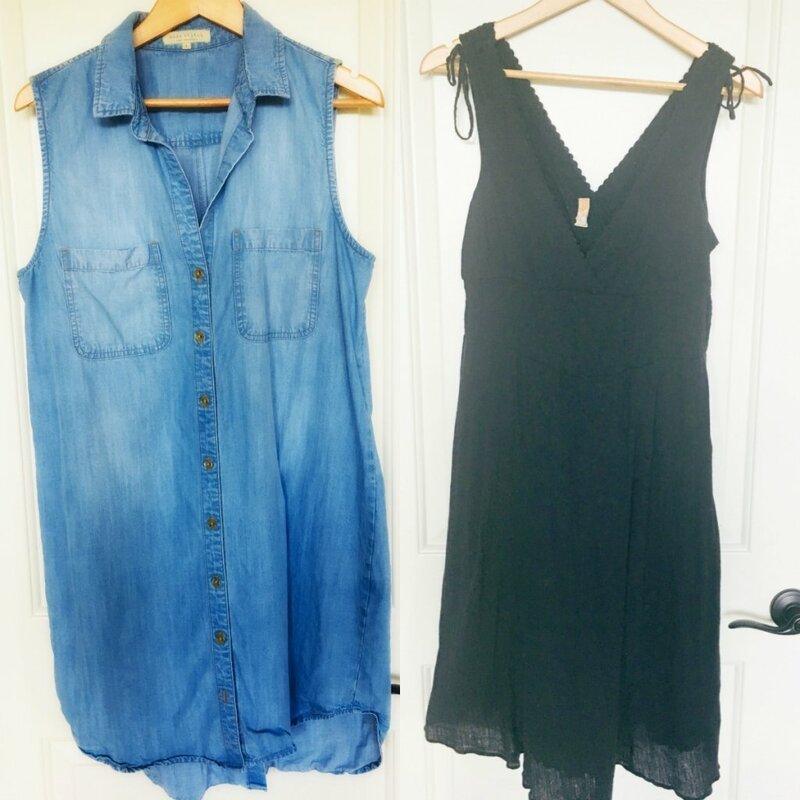 I scored the chambray dress on sale at boutique in Tomball and the other Anthro-brand dress off Poshmark. 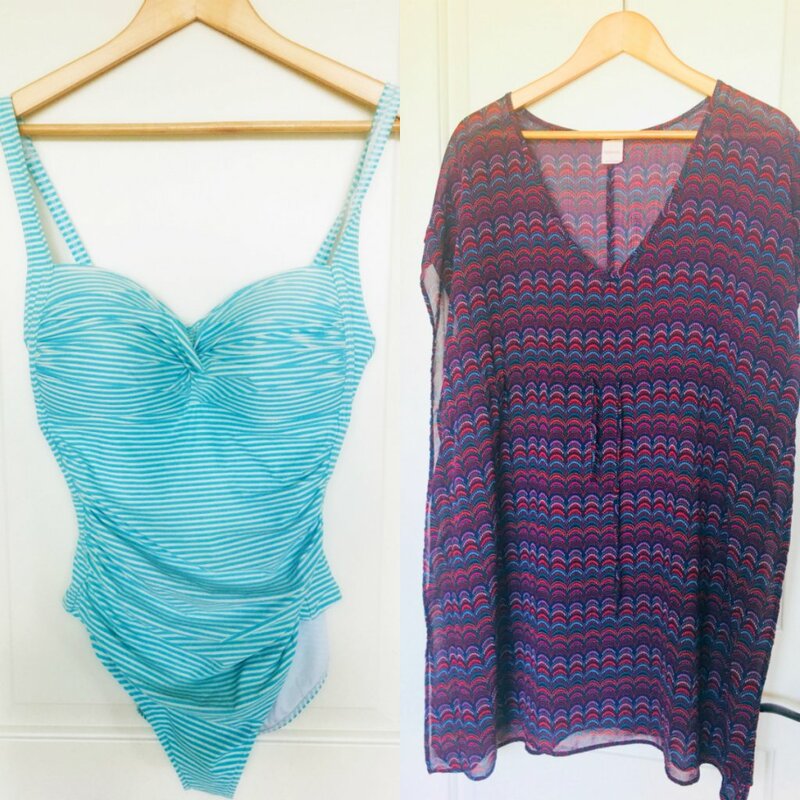 A swimsuit and beach cover-up. Both of these are thrifted and I LOVE them! 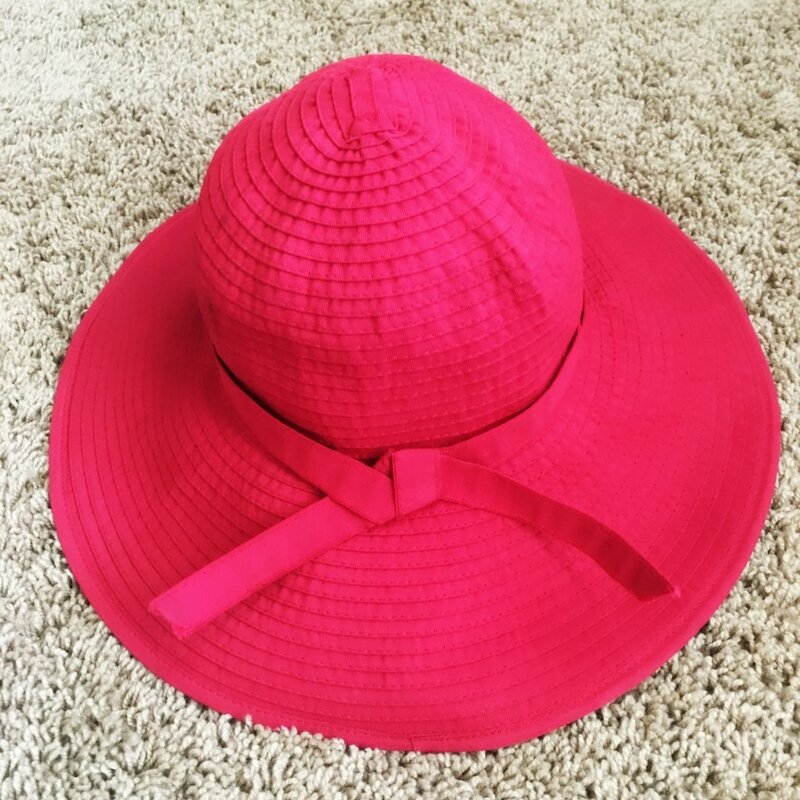 Okay, I admit I packed both my sunhats but ended up only wearing the red one! 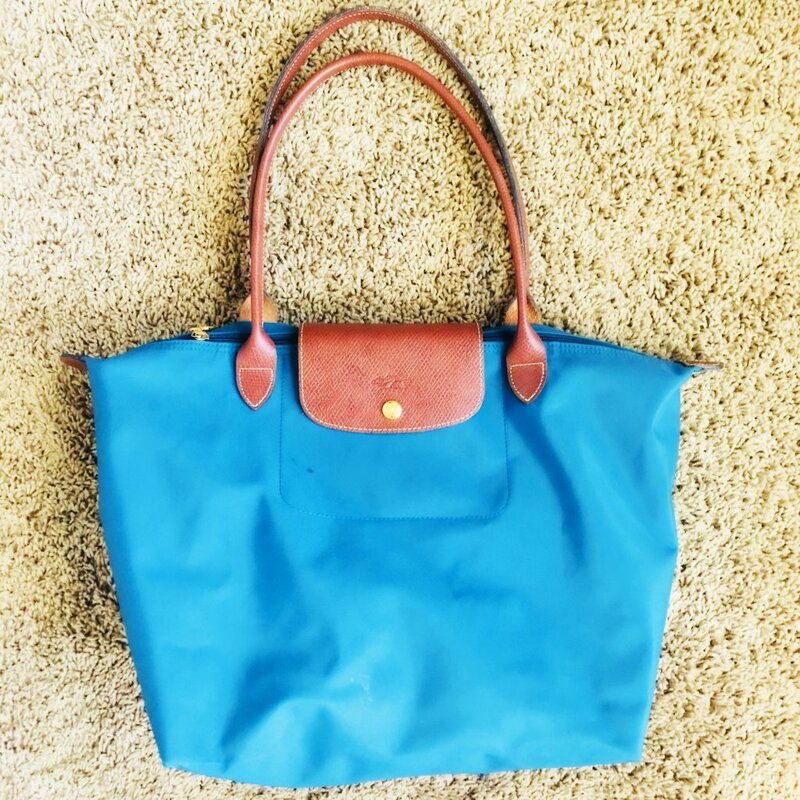 One bag – I got this Longchamp bag new-with-tags from Poshmark and I love it because it’s light enough to carry every day but waterproof and sturdy enough to carry as a beach or travel tote. That sucker can hold A LOT! I didn’t *need* all four pairs of shoes but I wore them all! You could make do with less but they pack small! THAT’S MY STORY AND I’M STICKING TO IT! 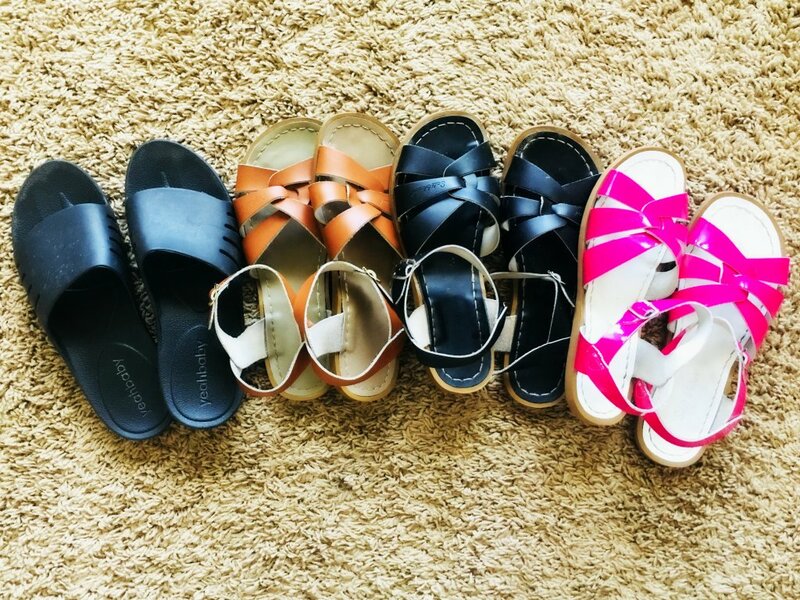 They are all secondhand, from left to right: spa sandals $5, tan Salt Water sandals $21 from Poshmark, black Salt Water sandals $22 from eBay and new-with-tags pink Salt Water Sandals $38 from eBay. IF I had to narrow it down, I would probably take the spa sandals and the tan Salt Waters. IF I WAS FORCED. 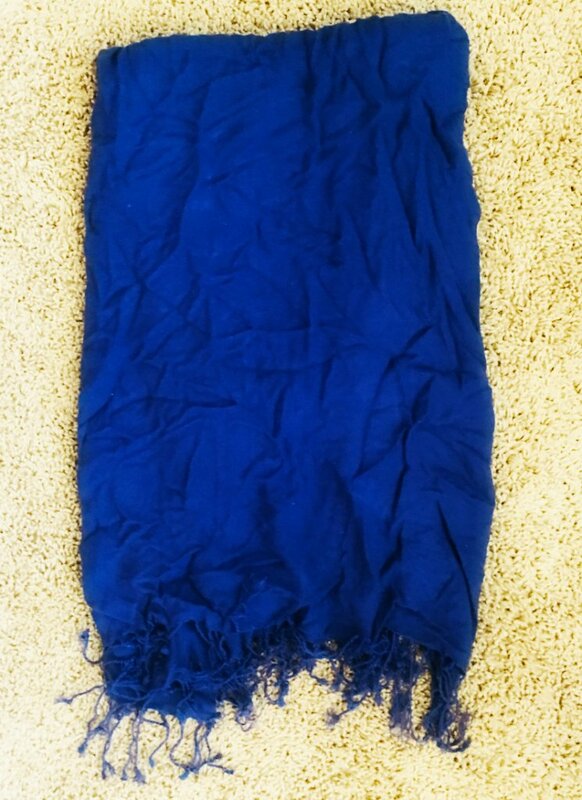 One light weight pashmina scarf. I thrifted this one for $3.50. I like that it’s navy – a neutral that can add interest to other neutrals. I didn’t wear it much because ALABAMA IS HOT but I liked it for early mornings on the dock. One pair of pajamas. 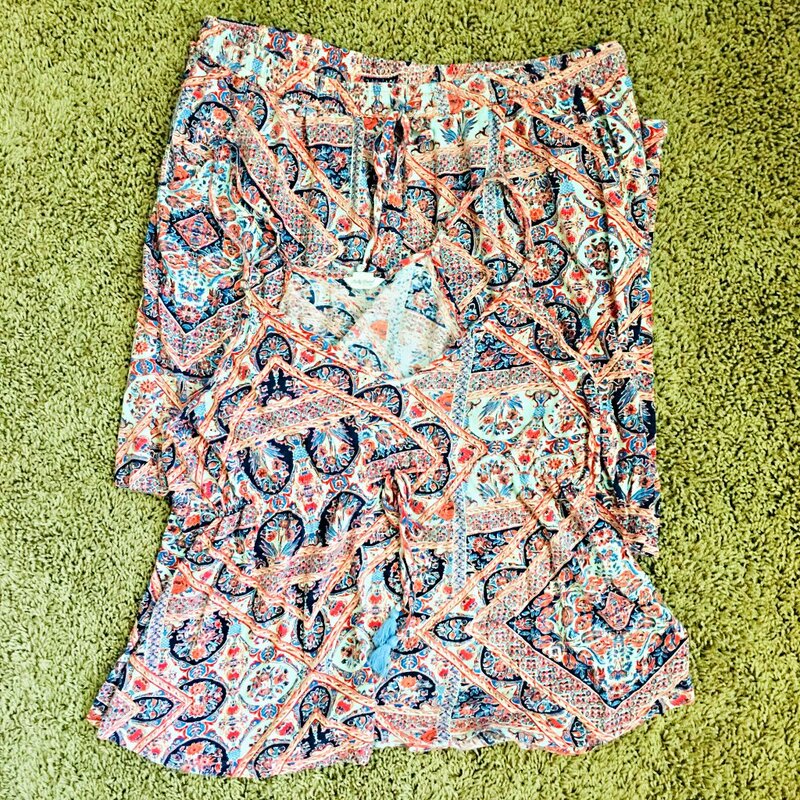 I thrifted this Lucky Brand set for $5 and love the print! I could have easily stretched these pieces to last longer than a week. Of course, I also had accessories – a small sampling of earrings, bracelets and my fave build-your-own pendant that could easily coordinate with any outfit. Sure you don’t *need* accessories at the cabin, but they make me happy so I brought them anyway! Plus they hardly take any suitcase space! Here is a sampling of what rode in my suitcase there and back from Alabama without seeing any action! I packed WAY too many swimsuits and covers. 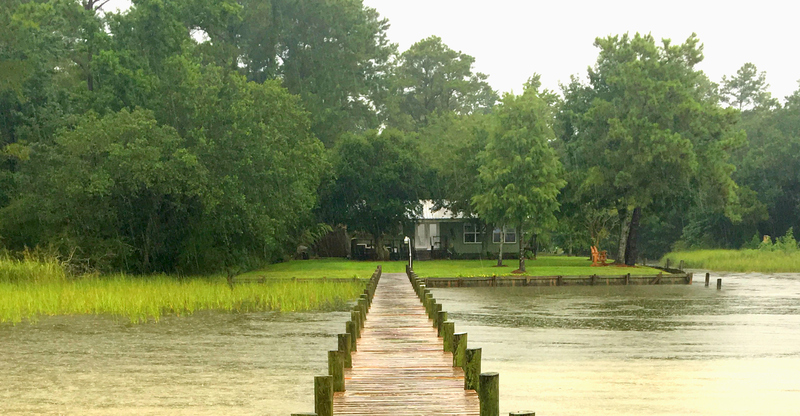 I thought I would swim off the dock every day but was content to read my books and sip cocktails on the dock instead. I definitely did NOT need any pants and I packed one too many dresses. Not shown – the robe I hauled along like a fool (HOT), one more pair of shorts, a small cross body bag that I didn’t use and an emergency rain coat which I wore for two seconds in New Orleans then decided I’d rather be wet than boiling. Toiletries including shampoo and conditioner – unlike hotels, VRBOs do not typically provide these. Sunscreen, bug spray, aloe gel and a medicine kit with a thermometer which we always take with us and inevitably end up using. Pet accouterments including food, leash, bowls and bags. This VRBO accepted pets so we took our Bernese Mountain Dog with us and she loved it even though she was hot. A couple decks of cards, crib board and dice for yahtzee! A small cooler to take to the beach and have in the van for cold bevvies during long drives. Corkscrew (never leave home without one), shot glass and travel mug. Some people like to have their own pillows; I like to have my own travel mug for coffee (and other, #spirited). Life jackets and fishing gear. Beach towels – this VRBO specifically requested that towels stay on the property so I was glad we brought our own towels for our beach day. Blankets – if you have kids, bring them each a cozy blanket. They’ll sleep better away from home with it! Headlamps for night time reading without annoying your brother or walking to the dock at night. In a moment of brilliance, I thought to pack our Alexa which was fantastic! I love having background music without having to have a screen on to get it. Laundry detergent – this VRBO provided some but we ran out. I wished I had brought along a few pods. Via coffee – I can’t abide crappy coffee which is what I usually find in rentals and hotels. Via coffee is so portable, I always have a couple in my bag. Wine and spirits – I love having a glass of wine in the evenings on vacay (obv) and experimenting with cocktails (obv). We brought a full bottle of gin since my hubby favours GTs and that’s what I used to do my vacation mixing! We did end up buying some fixings for the Alabama Slammer though because ALABAMA! 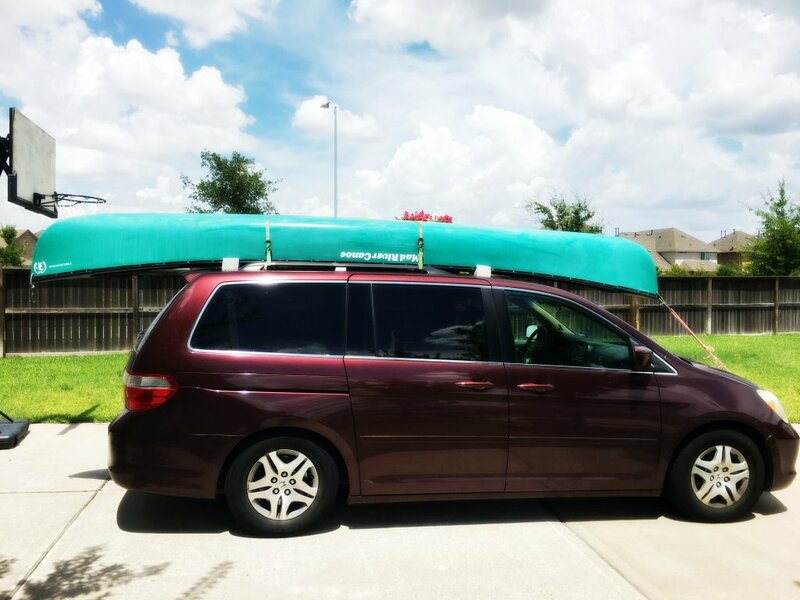 Between our five suitcases, our three kids, our 110-lb dog, paddles, fishing rods, crab traps, movies, road trip reading, and road trip snacks, the van was PACKED! We stocked up on some groceries for the week at the local Piggly Wiggly (!) and ate out a few times at local restaurants. We had everything we needed to have a fun time at the cabin! 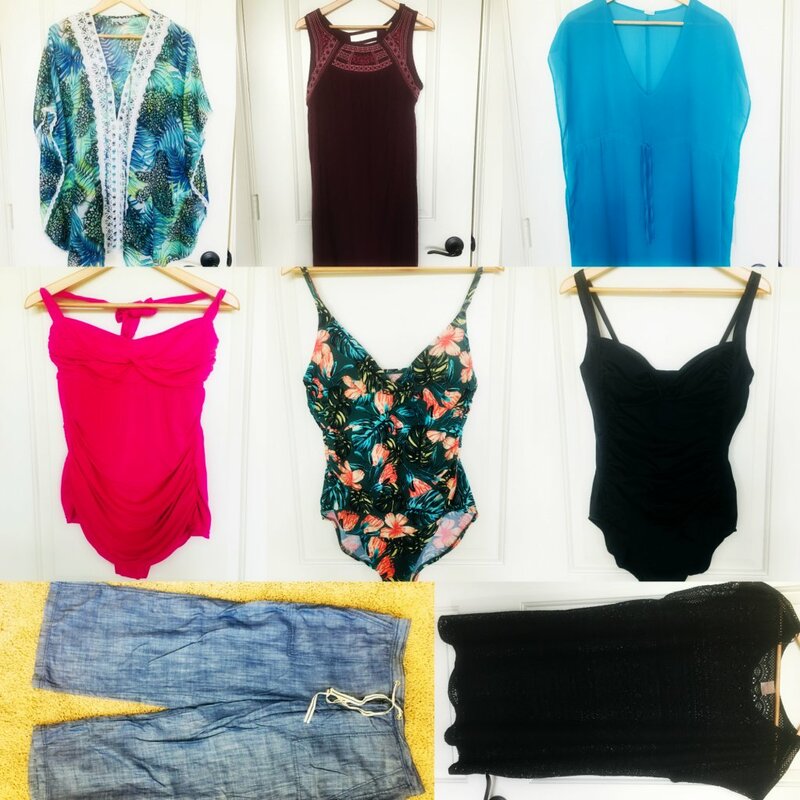 I hope this helps you decide what to pack for a summer cabin trip! Is there anything you would add to my list?! Isn’t Piggly Wiggly a crazy name for a market? It just makes me smile every time I hear it! I thought it was a joke at first! It does make ya smile though! Have you heard that Piggly Wiggly is merging with Harris Teeter and will now be called Big Wiggly Teeter? Seriously?!! That is too funny! !